Choose the right solution for your transport business. Our service exchange option was created for our customers who’d prefer their own steering, axle or transmission repaired. 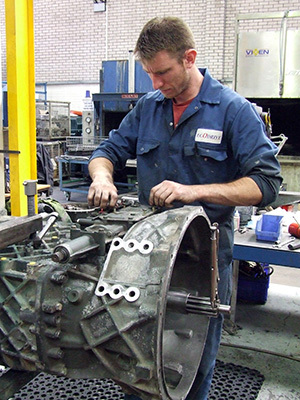 However, we also offer a quality VOR service for repairing your bus or coach gearboxes and auto gearbox repair. Whether its a specific and targeted repair on just the damaged part of the unit or a total remanufacturing VOR repair, the current exchange standards apply. If your failed transmission has parts of a specific or individual build specification, gearbox repair is undoubtedly the way to go. The difficulties posed by trying to source a remanufactured unit that fits an unusual specification mean that a repair of the faulty unit is will be the fastest and and most sensible way of getting your bus back on the road. But regardless of whether we are carrying out VOR repairs or offering a full service exchange, Ecodrive provide you with a solution that meets the same high standards and all are rigorously tested on the latest testing rigs prior to delivering them back to you. Keeping your bus or coach on the road is key to the success of your transport business places so its good to know that all our VOR repairs are comprehensively supported by extensive warranty packages, designed to work best with your business demands.